On Friday, we received word that Verizon was planning to slash prices on a bunch of phones by the end of the weekend. The Galaxy Nexus should drop to $199 on contract, but the DROID RAZR looks like it will go even lower. 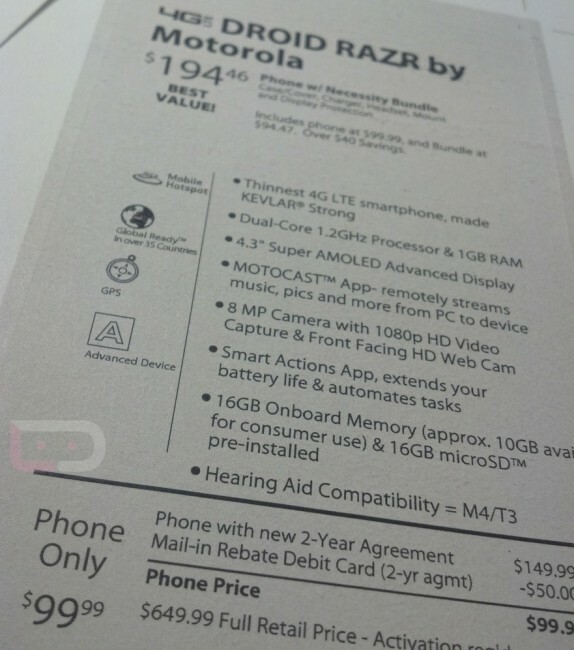 According to the store display tag we received a picture of, the RAZR will be available for as little as $99 after rebates and contract extending. What’s odd is that VZW is promoting some sort of Mother’s Day deal on the front page of their site right now for the 16GB model at $99, but this tag clearly states that this is the 32GB model. It looks like Big Red is doing some sort of instant discount to $149 and then slashing another $50 off via mail-in rebate. We should know for sure in the morning. The RAZR MAXX is not expected to drop in price.